Daffy Duck wreaks havoc on a movie set at Wonder Pictures ("if it's good, it's a Wonder"). Daffy's creative editing impresses producer I. M. Stupendous. Porky Pig and Daffy Duck owe an outrageous sum to the Broken Arms Hotel. The manager thwarts their efforts to escape without paying their bill. Porky Pig fights to get a room in the only vacant hotel in town. Unfortunately, he must share his room with Daffy Duck, who irritates Porky and makes the night uncomfortable for him. Daffy is an agent representing Sleepy Lagoon trying to sell him to talent scout Porky. Daffy spends a great deal of time and energy explaining and demonstrating what the kid can do, while the kid sits on a couch licking a giant sucker. On a tropical island a pair of castaways look to Bugs as a source of food. Wile E. Coyote set up an elaborate scientific contraption to trap Bugs. Von Hamburger: [after Daffy replaces the film in the camera with bullets] This isn't a gangster-r-r pictur-r-r-r-r-r-r-re! Q: What has been censored from TV prints? Daffy Duck is one of Looney Tunes/Merrie Melodies', and animation's, most iconic characters, as well as one of the best, most interesting and funniest, with several cartoons ranging from very good to masterpieces. Tex Avery was one also talented animator/director, with a style unlike any other and one that is immediately distinctive. He has also been responsible for some classic cartoons and also some memorable characters. 'Daffy Duck in Hollywood' was an early effort for both Daffy and Avery, and to be honest both have done much better than this. Not bad, in fact very nice on the whole, but both were more than capable in doing much more than just very nice. A noticeable flaw is the animation and character design of Daffy. Here in 'Daffy Duck in Hollywood' he moves awkwardly and looks crude, like there was still uncertainty as to how he should look. In fact, the character designs generally are not as carefully drawn or as fluid as they could have been. 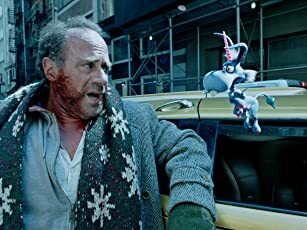 Didn't care much for the live action at the end either, oddly enough what the cartoon has been said to be most interesting for. The placement just seemed clumsily inserted and random, almost out of place, also didn't think they were needed or added much. The director character is amusing and interacts very well with Daffy, but the exaggerated way he speaks occasionally later on feels overdone. On the other hand, the rest of the cartoon is quite beautifully done, with lovingly detailed backgrounds and vibrant colours. The music brims with lively energy and luscious orchestration, not only being dynamic to the action and adding to it but enhancing it as well. The writing is witty and amusing, and there are some great moments in terms of humour. Particularly good are the incredibly clever cigarette gag and the scene with Daffy, the hen and the rooster and what happens afterwards. 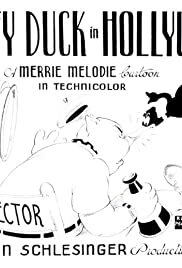 Characters carry 'Daffy Duck in Hollywood' extremely well and are fun, same with the rapport between them, and nothing can be complained about with the expert voice acting either, Mel Blanc especially having a ball.